I really like this recipe and have made it quite a bit, adjusting it so it is just right; and for a healthy(ish) slice with oats and seeds, it tastes really great. In fact, this is pretty much like a big ANZAC biscuit but with added seeds and spices and icing. I find this slice is perfect a day after it is made, as the texture is fudge-like and very moreish. I store this slice in the fridge, and for the perfect eating consistency, bring it up to room temperature. As a change you can try adding dried cranberries, sesame seeds, or chopped crystalised ginger. Heat butter, sugars, and golden syrup in a medium saucepan until melted, then simmer mixture for one minute until golden in colour. In a large heatproof bowl, combine flour, baking powder, oats, coconut, sunflower and pumpkin seeds, and spices. Add warm syrup. Mix together well. Press into a slice tin and smooth top firmly with a spatula. Bake for 18-20 minutes until the edges start to turn golden. Leave the oat slice in the pan to cool. 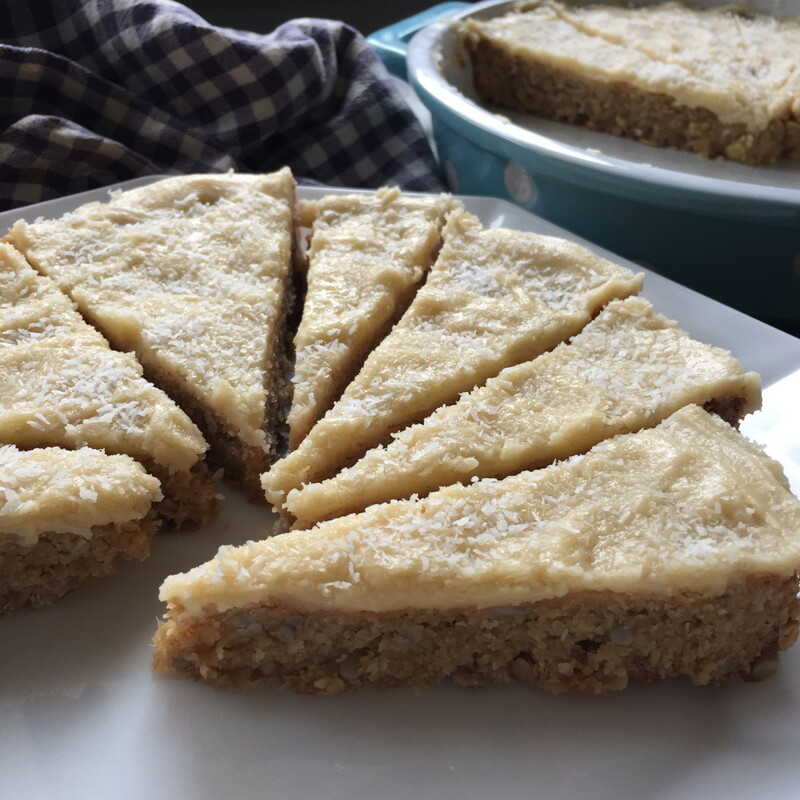 Make the ginger icing by combining all the ingredients together until smooth, and when the oat slice is almost cool, spread the icing over and sprinkle with coconut. Cut oat slice into pieces when the icing is cool.